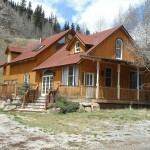 Relax in this rustic, yet elegant 2-story home located in the heart of Silverton, Colorado. 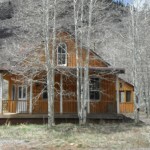 The McCormick house is within walking distance of all Silverton has to offer. It features an open-air floor plan with a massive gourmet kitchen that will satisfy even the most skilled chefs. In addition, the house features two upstairs bedrooms with 18-foot vaulted ceilings and two full bathrooms. The beautifully designed upstairs bathroom features a mammoth-sized walk-in shower that has skyline windows for you to soak in the panoramic views of the mountain tops above. This house comes equipped with two sets of washers and dryers to help ensure your stay is stress-free. The living area displays exposed beams, is equipped with a gas log wood stove, a TV/VCR/Stereo System (no tv service), internet, and it opens to a large wrap around porch by way of beautiful French doors. During the summer months, enjoy a BBQ out on the deck with the gas grill while you take in the majestic views of Kendall Mountain. The first floor also provides a third bathroom with the original, refurbished claw foot tub. This truly is a one of a kind home that will satisfy your every need, whether you are looking for adventure or just a place to lay low and relax.